ICC Summer Camp | Second Session is starting from Tuesday 31-July, 2018 from 9:00 AM – 2:00 PM. Register for 4 weeks of Summer Camp, and receive 1 week absolutely free. 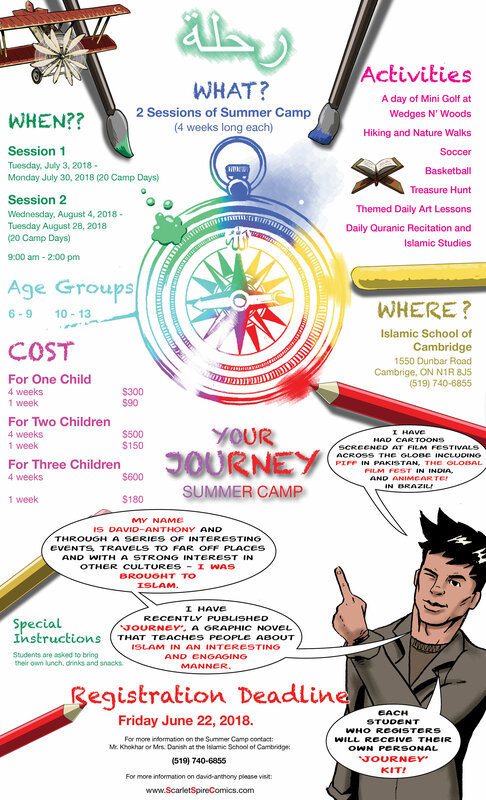 ICC Summer Camp includes weekly trips, daily fun games, activities (skating, YMCA swimming, treasure hunt, biking, nature trail hiking), daily snacks (samosas, freshly made popcorn right out the machine, juices, sandwiches, chips) & islamic education so we have a team of four young, energetic and very experienced individuals as staff members for the Summer Camp. As the attendance has increased many folds over the past few months, there is an overflow from the Main Prayer Hall into the lobby so we request you not to use the Floor Area without Carpet (near the water fountain) to pray, as it blocks movement after the Jum'ma Prayer. In order to accommodate everyone, "Hall B" Downstairs is available every Friday and when the Main Prayer Hall is full so we put up a sign outside requesting people to go down to the "Hall B". When someone suggests you to go downstairs so please do not argue, as we are looking for your well-being. Due to security & safety reasons, we need to lockup the premises every night right after Isha Prayer so thank you for your understanding and cooperation. Mark your calendar for a lecture given by Ustadha Dr. Farhat Hashmi on Sunday 22-July, 2018 at Kitchener Mosque from 3:30 PM to 5:30 PM. Mark your calendars for AGM on Sunday 15-July, 2018 at 2:00 PM so please come and join us. ICC Summer Camp is started from Tuesday 03-July, 2018 from 9:00 AM – 2:00 PM. We are pleased to announce that ICC Summer Camp is started from Tuesday 03-July, 2018 from 9:00 AM – 2:00 PM. ICC Summer Camp includes weekly trips, daily fun games, activities (skating, YMCA swimming, treasure hunt, biking on a nature trail), daily snacks (samosas, freshly made popcorn right out the machine, juices, sandwiches, chips) & islamic education so we have a team of four young, energetic and very experienced individuals as staff members for the Summer Camp. Please honour your pledges from our last Fundraising Dinner of June 2018 so feel free to contact the office, if you would like to spread out the payment.